Police plan to publish pictures of people who fail to attend court for serious crimes, including burglary, robbery or assault, on their website. 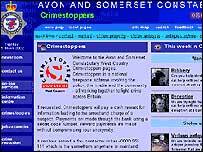 Avon and Somerset Police say the 'wanted' gallery will cover both the magistrates' and crown courts. The new tactic will help "find the handful of people who dodge court and bring them before the justice system". The gallery will be launched on 10 June, to give the 'bail bandits' time to come forward before being featured. Chief Constable Steve Pilkington said: "Out of the thousands of people arrested and charged with serious criminal offences each year, a significant handful of people avoid the legal process by failing to turn up at either magistrates' or crown court. "We take this offence as seriously as the original crime the person was charged with. "Apart from wasting taxpayers money, it frustrates witnesses, prolongs the distress for victims and undermines the criminal justice system. "We need to bring these bail bandits to book. "Posting their pictures on the wanted section of the website and in the media is a new idea which needs the support of our local communities to be successful. "We want friends, relatives or the local community to let us know where they are and why they failed to appear at court. "Those people featured may also choose to give themselves up," he added.